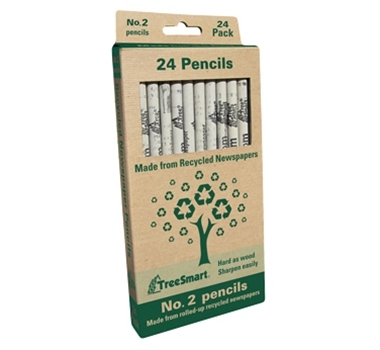 TreeSmart’s #2 Pencils are made from Recycled Newspaper instead of virgin wood. TreeSmart has developed a process that essentially “turns the paper back into wood” making the pencils just as hard and solid as wood. The barrels of these pencils are tightly rolled from torn strips of “yesterday’s news”! They write smoothly, sharpen easily, and support recycling. These pencils come with The Ultimate Green Store imprint. Newspaper pencils also sold with custom imprinting in minimum quantity of 500. For more information contact us at sales@theultimategreenstore.com.